This is a common sight in my area, and I never tire of it. I pass this barn twice a day... on my way to work, and on my way home from work. This barn always catches my attention, and I have several photos of it. However, this photo that I took the other day, is probably my favorite so far. The sunny day really caused the colors to stand out beautifully, and I love how the roof of the barn stands out against the blue sky. Click on this link to find a wireless router so you can sit in comfort on your couch while viewing all the Sky Watch Photos! So, once you are comfy - Click here to check out more Sky Watch participants or to join in on the fun yourself. I love old barns. I've always wanted to do a coffee table photo book of just barns. I'm sure it's already been done before. We're losing more and more of our old barns and they just aren't made the same way anymore. It's really sad. Most lovely rusty texture on that roof. The shape is funny too. I love the play of colors here. The rusty roof and the lovely blue sky. The man said 'Rust in Peace' but that is 'peaceful rust'. I like your shot with the barn pretty...Happy SWF! Great shot of the sky and the barn! 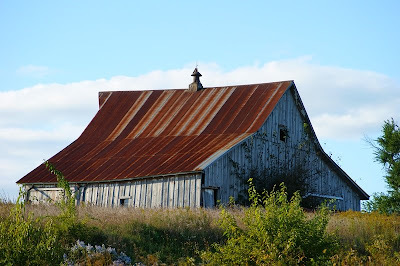 great contrast of colours, with the barns rusty roof and sky. That's a lovely barn. It does look good against the sky. That is a great barn photo. Hubby likes to take pictures of barns. I did get a wireless router and I am doing exactly that sitting on the couch with my new laptop reading your blog! how neat! I do love the red and blue together. You should frame this pic since this barn is important to you when you pass it every day. That barn is so pretty I wonder you don't stop long enough to paint it! Maybe not exactly in stripes like the roof, but I'm sure you know what I mean. I'd get my sketchbook out straight away. I love the stripes on that barn. The contrast with the sky is marked. It could be a painting. I love your barn photo! It's always nice when a photo comes together like this. Lovely! Very cute! and great photos, too. Thanks! Misty: What a neat shot of the barn with a great cloud behind, Great SWF. great sky watch and I so love the calf in the post above how adorable! I like this photo, too. I have a barn that I bet I have at least 25 pictures of. And it isn't even near me, it is by a place we used to fish at. I too would be attracted to the colours and textures of this barn too! Most attractive with the blue of the sky!